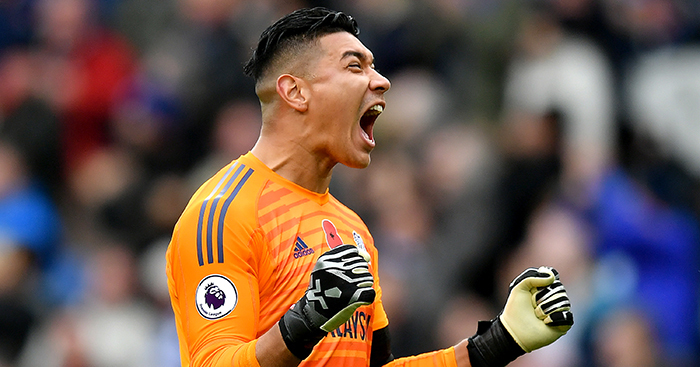 Neil Etheridge is currently enjoying his first season in the Premier League, but money demands meant the Cardiff City goalkeeper nearly didn’t have a career at all after leaving Fulham. Etheridge started all but one of Cardiff’s games last season as they were promoted from the Championship as runners-up and has maintained his position as No.1 since making the step up, becoming the first Filipino to play in the Premier League. The 28-year-old has started all 15 games so far, helping Neil Warnock’s side steer clear of the relegation zone, but it’s been a far from straightforward journey back to the top flight since he was released by Fulham in 2014. Etheridge, who was born in Enfield to a Filipino mother and English father, took up goalkeeping at the age of 10 and joined Chelsea’s academy three years later in 2003 before switching to Fulham in 2006. He went on to sign professional terms at Craven Cottage but despite four separate loan spells only ever made one senior appearance for the club – in the Europa League in 2011. Still, he was on a Premier League wage, which created a problem when he was let go by the Cottagers following their relegation. “The team had just got relegated to the Championship and it had been a really tough season for me being injured for the majority of it,” Etheridge says. A number of League One clubs were interested in signing Etheridge, but he turned them down, believing he would be able to secure a contract on the same terms he had been on at Fulham. “It was the naivety of making wrong decisions due to money and not really seeing the bigger picture,” he says. Even when Etheridge received a helping hand from his friend Ben Roberts, who was at the time the goalkeeping coach at Charlton Athletic, the then-24-year-old failed to grab the opportunity he had been offered. “I knew I had to keep myself fit. I was fortunate enough to know Ben Roberts so when pre-season came about I asked him to train with Charlton,” Etheridge says. “I was living in west London so I was travelling to the east which took me about an hour and a half just to train. The manager there said he loved me and offered me a contract, but I ended up turning it down trying to negotiate hard. Roberts highly believed in Etheridge and continued to find him clubs in League One and League Two interested in signing him, but there was always conflict over money and it wasn’t until the Filipino was forced to sell his house and his car that he started to accept reality. “As time went on I started to see the reality of football I guess in the sense that it wasn’t going to be an easy ride,” Etheridge says. “It was all about the timing and the bad decisions I made. I put myself in a situation where around the end of September I called everyone I knew from goalkeeping coaches, agents, Ben Roberts, people in the industry offering to play for free. Then, just days away from returning to the Philippines, out of the blue, Etheridge received a phone call from an agent with an offer. Etheridge thought it was an opportunity he would grab with both hands, but he made only one appearance for the club, in the Checkatrade Trophy against Preston, and was soon having to deal with another setback. Ending in a draw, it went to a penalty shootout, as they reached 11 penalties, Etheridge missed his and cost Oldham the tie. “It was my first game for the club, it was obviously a disappointment and it was kind of down to me because I missed the penalty,” Etheridge says. 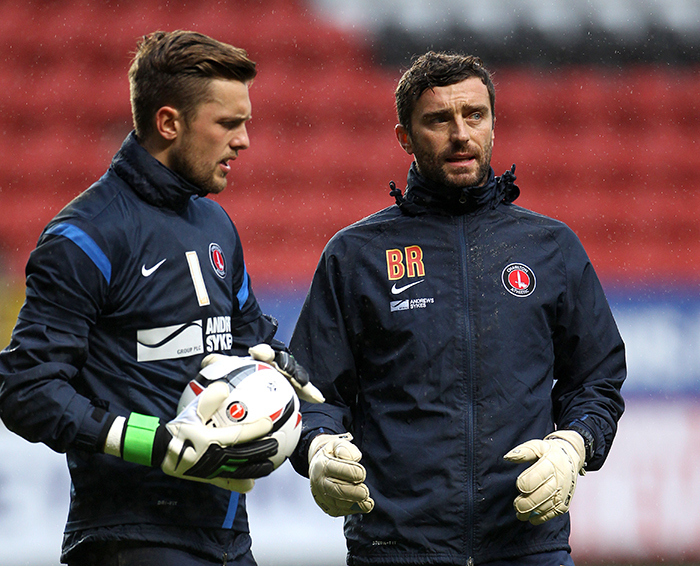 Thankfully for Etheridge, Roberts, now of Brighton, once again came to his aid when Charlton’s first-choice goalkeeper Stephen Henderson got injured and Roberts advised manager Bob Peeters to sign his friend on loan in November 2014. “Ben has been fantastic to me,” Etheridge says. “He believes in all sorts of goalkeepers and all sorts of walks of life, and he doesn’t look for just Premier League goalkeepers, he looks outside the circle. Etheridge signed a permanent contract with Charlton until the end of the season, but his real break did not come until he joined Walsall ahead of the 2015-16 campaign – and he has another goalkeeping coach to thank for that. “I was in the Philippines and I got a message from Neil Cutler (currently at Aston Villa). If Ben Roberts did a lot for me then Cutler definitely did too. Etheridge duly signed a contract with Walsall and in his first season helped guide them to the play-offs. Finally establishing himself as a first choice, he made 93 appearances across two years before joining Cardiff in 2017. Immediately installed as No.1 by Neil Warnock, Etheridge kept 19 clean sheets in 45 appearances as the Bluebird booked their ticket back to the top flight. 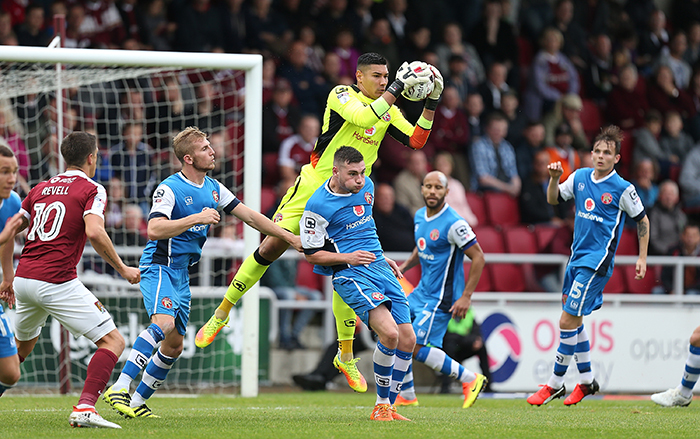 “I was happy just playing in the Championship, let alone looking for promotion,” Etheridge says. Handed his chance to showcase his ability at the highest level, Etheridge did not disappoint, becoming the first goalkeeper to save a penalty in both of his first two top-flight appearances since Erik Thorstvedt for Tottenham back in August 1992. “Starting in the Premier League was a massive achievement on a personal level, and then being the first South East Asian player to play in the Premier League was fantastic,” Etheridge says. “The penalty saves obviously caused a lot of attention and it was great to raise my profile, but it’s all about keeping the shirt and helping the team. Despite being currently outside of the drop zone, Cardiff are still third favourites with the bookmakers to be relegated this season. Etheridge is realistic about the battle ahead but says the type of player Warnock has bought will be key when the chips are down. “At Cardiff we know the situation, we know it’s going to be tough for us to stay in the Premier League this year,” he says. “However, what makes us different is that we are like a family. We have a great bunch of players and didn’t bring in too many over the summer. “Many times last season people wrote us off even when we were in the top three, but we stuck together and we knew exactly what we’ve got to do and were able to achieve that together. “The manager brought in players who have something to prove. You look at the players we have in our dressing room, including myself, we may not be the biggest names, but all of us would work together and fight together. Etheridge ends the interview by sharing a few thoughts on his days of struggle and has a message for anyone going through a rough patch in their lives. “When you get on the pitch you suddenly feel like a superhero, the crowds are there and they’re cheering your name, but when that’s taken away you’re just a normal human being. “When you reach such a high level at a young age you don’t think it’s going to end, you think that bubble is indestructible and to a certain extent you think as a human being you’re indestructible, but you’re not. “A football player is still a human being. We have all the newspapers and social outlets that we could talk to the world through, but in the end we are still human beings and we find things tough at times. “It’s a blessing that I am able to tell my story because I know a lot of people go through tough times. You can have any job and you’ll find yourself going through sticky patches, but you’ve got to believe in your ability, have good people around you and eventually things do work out. “You may change what you thought would be the original path, you may need to go down a long road like I did, but no matter who you are you can always change and improve as a person. “Giving up and walking out the door some people might say is the easy option, but I hope people will face their struggles and see their goals as the only way out.